Summer is on the way in the Northern Hemisphere, and that means bathing suit season is right around the corner. So it’s the perfect time of year to work on those “love handles” all the while you’re strengthening your bones. This weekend’s challenge does exactly that, and more. The Balancing Core Strengthener targets the core muscles, including the abdominals and the often neglected obliques, which are the muscles along your sides. It also works the legs and promotes balance, stability, better posture, and a slimmer figure. First, let’s look at the specific abdominal muscles this exercise works. When most of us think of the “abs,” we generally picture the front of the stomach. But the abdominals encompass a lot more than just the belly. Here are the four main groups of abdominal muscles, all of which get worked in the Balancing Core Strengthener. The External Obliques run along either side of your abdomen. They originate from the fifth to twelfth ribs and attach to the pelvis at various points. The external obliques support spinal and trunk rotation. They also pull the chest downward in abdominal compression. You use your external obliques every time you twist or turn, or lean from side to side. The Internal Obliques are also along your sides, but they are located inside the pelvic bones. They work in opposition to the external obliques – when you turn to the left, your left and internal obliques contract along with your right external obliques. The Transversus Abdominus is the deepest of the abdominal muscles. It’s a core muscle layer, located directly beneath the internal obliques. The transversus abdominus provides pelvic and spinal stability, and is instrumental in childbirth. This muscle is very important for strong core and lower back muscles in general, but it’s also key in pulling in your tummy (this may be why its nickname is “the corset muscle”!). The Rectus Abdominus is the classic “abs” muscle, and is what you see when a body builder shows off his or her “6-pack.” The rectus abdominus runs between the ribs and pubic bone, which is located at the very front of your pelvis. It’s a key postural muscle, helping to flex the lumbar spine and perform sit-ups. In addition, the rectus abdominus assists in breathing, both inhaling and exhaling. Like the transverses abdominus, the rectus abdominus also aids in childbirth. The Multifidus, a deep muscle of the back. It connects along your spine and works with the transverses abdominus, enhancing spinal stability. A strong multifidus muscle helps guard against injury and muscle strain. Many of you have asked about what, exactly, the core muscles are. The four muscle groups listed above are part of the core, as are pelvic floor muscles, some muscles of the back, and many others. Your core is something like a sturdy column that connects your upper and lower body. It holds your spine and pelvis stable, and allows you to bend, twist, and stand firmly and move capably. It’s essential for balance and posture. Now let’s take a look at how to do this weekend’s challenge! While you don’t need any special equipment to do the Balancing Core Strengthener, you should make sure you’re near a chair or wall in case you need to catch yourself. Stand with your feet shoulder width apart, toes pointing forward. Point the toes of your right foot out to the side and bring the leg out a bit. Now bring your right knee up and your right elbow down so they touch. Bring your right leg back down almost to the floor. Repeat 25 times, or as many times as you comfortably can. As you do this exercise, pull abs inward to keep the muscles tight’. Make sure your engage your abdominals and obliques, so you’re not just moving your arm and leg around. Try not to bend to the side to get your elbow and knee to meet. Keep your face forward and your spine and neck straight. This fits perfectly with Densercise™, which is practiced three times a week for just 15 minutes. And Densercise has plenty of balancing exercises that work your stabilizing muscles and reduce the risk of falls that could result in painful fractures. I can’t wait to hear how the Balancing Core Strengthener works for you! Please leave a comment below to let us know. 1 Kahle, Nicole and Tevald, Michael A. “Core Muscle Strengthening’s Improvement of Balance Performance in Community-Dwelling Older Adults: A Pilot Study.” Journal of Aging and Physical Activity. 2014. 22, 65-73. PDF. an injection twice a year with Prolia. The main reson is my rearly poor back. Untill now I have rejected her solution, but now my back looks very bad. My age: 85 years. If this exercise does everything you say, I should be on better shape soon since I’ve been doing it several times a day. My balance does seem better already. Thanks for good info! I found this one extraordinarily difficult – in fact I cannot get my knee and elbow to meet. It looked so easy on the diagram. Keep up the good work and hints, all appreciated. I wish you success on the Program! Is Densercise available in book form? Who wants to exercise while trying to look at a computer which may not even be in a position that allows room to exercise in front of it. To print it out would take a hundred bucks worth of ink. With today’s printing methods, why not a book? I agree with Eleanor peed. I couldn’t do the exercises while looking at the computer and agree it would have been OK if it had been a printed version. In the end I had to ask for a refund which I received without any probs. As a help, I printed my exercise book and then put it in a 3 ring binder. This is almost better than a bound book because the pages stay flat and stay where you turn them as you go. I have severe scoliosis which impairs some smooth movements. Will I get benefits even though I’m limited in some of these movements? I’m in good health otherwise. Thank you for your feedback. At age 67 and in nine more days 68 it was a great challenge. Because I can barely bend my right knee due to arthritis. I plan to keep exercising. Great work, Shar’Ron! 🙂 And you are welcome. Am not able to bring my knee and elbow together without bending my side. Also touching the floor as I bring my leg down. This is difficult for an almost 80 year old. I’m thinking the foot returns but does not touch the floor in between reps, otherwise, where does the “balance” part, working the core come in? Can I download the exercises to my computer? Are all (or most of ) the great WEEKEND CHALLENGE EXERCISES in the Dancercise book? And is this a real book or an e-book? I am interested in a real book, not another e-book. 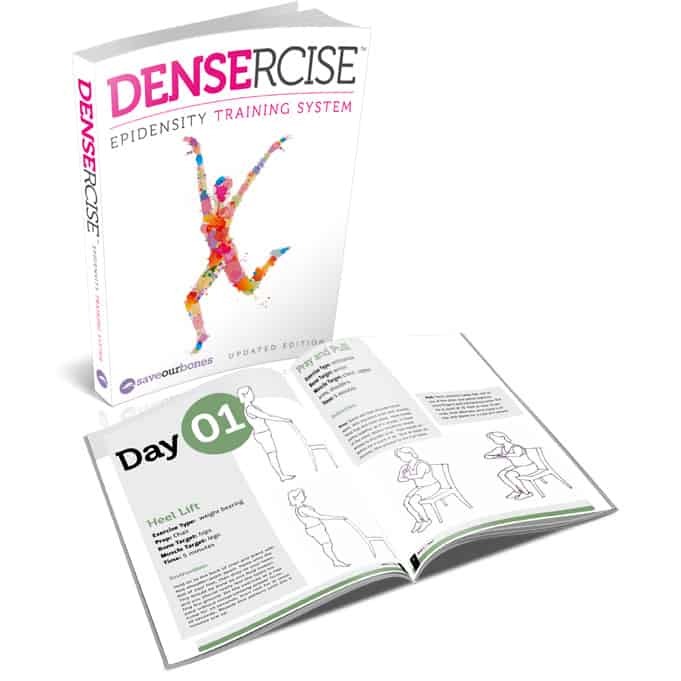 The Densercise manual is delivered digitally to your inbox as a PDF file. The video collection, where Vivian briefly shows you how to do each exercise, is intended to be viewed online. You can log in and enter your password any time you need clarification of the moves.